At this rate, itch.io is well underway to becoming a jack-of-all-trades site, which is not a bad thing at all. Their main attraction will likely always be to offer developers a home for their creations, free or not, but they did recently add game jam hosting, and now developer curated bundles are also a thing. Neat. 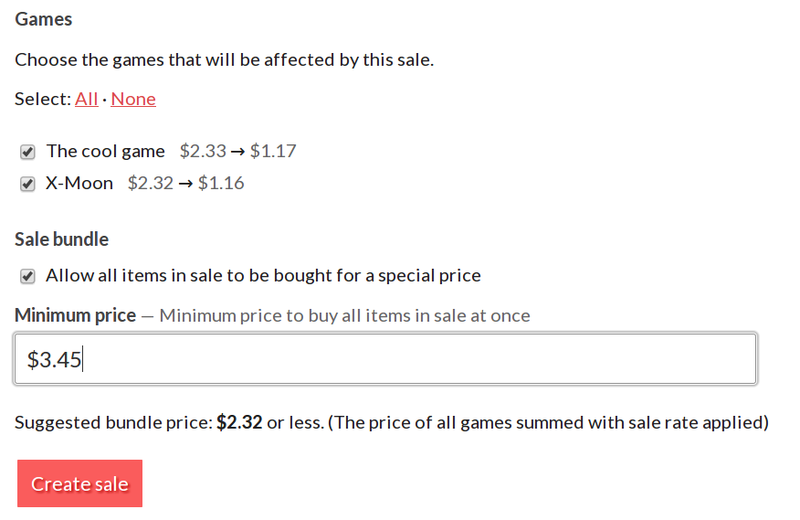 What this means is that developers with games on itch.io can now bundle their creations and slap a discount on it. If you only have a few projects on-site, chances are this won’t be extremely interesting (as a developer, anyway), but anyone with more than a handful are bound to find a use for this new addition. I mean, if recent Humble Bundle have taught us anything, it’s that people like buying indie games in bulk. The only requirement to create one of these fabulous bundles is to have a minimum of two purchasable games [on itch.io]. Then it’s just a matter of heading over here, ticking the right boxes, filling in the blanks etc., after which it’s time to rake in the big bucks! Or at the very least, (hopefully) have your games pay for that next Starbucks trip. Remember, your bundle, your choice, your price tag. Attach a single digit percentage discount or go crazy. Oh and for those more interested in spending money than making it, here’s a list of current itch.io bundles. The current lineup, while hardly massive, does feature discounts with price tags ranging from ‘dirt cheap’ to ‘worth considering’, on top of being nicely varied. Besides, I’m sure that as word of this feature spreads, we’ll see page upon page of developers selling… heck, their entire library, should they so desire. Time will tell!